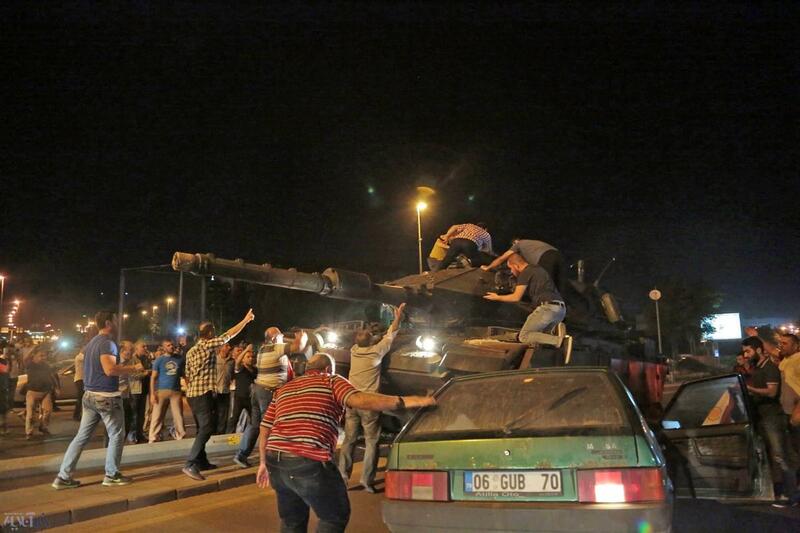 The latest crisis in Turkey triggered by the so-called military coup attempt is not the first of its kind. Military coups have become a sort of tradition laid down first by the Young Turks, or even the Janissaries. One must note that the “Young Turk Revolution” in 1908 too began as a military coup. Turkish military elites were behind the military coups of May 1960, March 1971, and September 1980, appearing upon the political scene each time when there was a need to defend the gains of the Kemalist Republic. Back in 1997 it was the military elites that forced Turkish Prime Minister Necmettin Erbakan to shift Turkish laws toward secularism. It is a fairly well known fact that Turkey’s military forces are a stronghold of Kemalism. Young Turkish students, the future officers, since their first days of training the spirit of unconditional devotion to the revolutionary achievements of Kemal Ataturk” impressed upon them. At the same time, most radical parties behind the cloak of Islam in Turkey have always despised the army who seems to be always standing in their way. Every attempt they make to strengthen their positions within the political arena have always ended with military coups. The Turkish military retains the status as the most influential state institution in the country since it has been defending the secular nature of Turkish politics for decades. However, a number of peculiarities during this latest “failed military coup” raises doubts that military officers were behind this violent episode. First of all, everyone was likely aware that President Erdogan took leave from the capital to enjoy a sort of vacation, therefore any “revolutionary” attempt would have targeted his residence along with the government buildings in Ankara. However, according to Turkish media sources, those behind the coup failed to implement this essential step in seizing power. 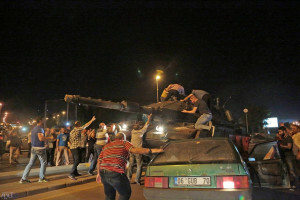 The government quickly established that Colonel Muharrem Kose and a number of officers belonging to the Turkish military attaché services were allegedly behind the coup. Therefore they claim that the officers that were in charge of signing military contracts with foreign countries were in charge, which, in their opinion, means that the coup was triggered by the disruptive forces that are aligned with the exiled preacher Fethullah Gulen. This was the claim Tayyip Erdogan made via his smartphone in an interview with CNN’s Turkish studio immediately after the coup began, accusing his former ally who now poses as his sworn enemy. One must remember that Fethullah Gulen is in control of a business empire worth 20 billion dollars, run from his office in the US, where he has been residing in self-imposed exile. Recep Tayyip Erdogan has been in power for over a decade now, since becoming prime minister in 2002. Without a doubt, he has been the most influential and transformative politician in his country since Kemal Atatürk. In domestic policy, Erdogan has been obsessed with the construction of an authoritarian presidential regime, although during the first decade of his rule, he has been perfectly capable of handling all the issues within the framework of a parliamentary system. He has come a long way and along this road he has become a ruthless dictator. He has been brutally suppressing demonstrations and protests, blocking unwanted media channels, and restricting every kind of freedoms. He has even been trading refugees, exploiting their desperate circumstances to achieve specific political goals. Erdogan is consumed by nostalgia for the Ottoman Empire’s days and the dreams of Turkey being at the head of the “Muslim World.” He cannot sit quietly in his White Palace, which he had built with the apparent prospect of living (and leading from) there until the end of his days. The only problem he could encounter on the road to the absolute tyranny were Turkey’s armed forces – the last defenders of the Kemalist Republic. On March 14, 2016, Erdoğan publicly called for the Turkish definition of a terrorist to be broadened to include supporters of terrorism, equally guilty and subject to punishment . It was heavily implied that this amendment would be used to implicate political and business figures. In addition to the “terror card”, in a bid to deal with his political opponents, Erdogan coined the term “puppeteers” which he introduced during a public debate about two years ago when he said that there are “puppeteers”, or rather “higher intelligence” controlling political developments in the the Middle East. Supporters of Erdoğan then extended the usage of this term and identified the US, Great Britain and Zionists as “puppeteers” and then made a list of their plots. One of the strongest supporters of Erdogan, editor of the pro-government Milat newspaper, called Fethullah Gulen, “Gyulizabeth”, claiming that he has been serving the British Crown. Looking at the events of “a failed military coup,” one cannot forget that the active participation of military leadership in the political life of the country is one of the hallmarks of Turkish history. Erdogan, in the speech he gave almost two decades ago announced that Turkey would do away with this “behind the scenes military government,” and promised to reform civil-military relations. Moreover, it has become convenient to carry out these reforms in the context of the Europeanization of Turkey, as the EU demanded from Turkey the establishment of new civil-military relations where the army should remain in their barracks to serve civilian administrations instead of telling them what they can or cannot do. “Army’s fault” in the latest developments, of course, will be actively used by Erdogan for undermining the authority of the military command in demanding new additions to the country’s constitution that would fit his own interests. It’s really important how timely a manner the state controlled Turkish media sources have twisted the whole situation to fit Erdogan’s plans. This, of course, can be attributed to the assistance that Washington has been providing Turkey in the creation of a so-called Turkish “information force,” being trained in Ukraine. As stated at the presentation of the project head of the Turkish General Staff, Hulusi Akar, the “information force” will be used to neutralize “any threats and challenges” within Turkey. As for the severe punishment of those who took part in this “failed military coup”, Erdogan’s cruelty has already been demonstrated even by his allies, and there’s little doubt that this too was a part of this provocation, no matter what Turkish media sources say otherwise.